Radcliffe Line as seen from The International Space Station. This image captures the floodlit border between India, above the orange line, and Pakistan, below the border in the picture. Written by Manto, the literary genius from India’s pre-independence era, this allegory which is satirical at times questions the futility of war and the bedlam. It portrays the consequences of communal politics and the perplexing case of forgotten identities. The plot revolves around a stray dog trapped between two frontier posts of the Indian and Pakistani armies. The partition took many lives in its wake. Soldiers who were earlier fighting the British for freedom had suddenly found enemies in each other. It wasn’t merely, the land which got separated by the ramifications of Radcliffe line but relations. Once you are done reading the story, the irony of identities hits on you. You find yourself rebuking the pseudo soldiers, the radicals gloating over their prized sport kill─ the stray dog who falls as a quarry to the military or shall I say the militants. And the question looms large― what insidious pleasures would they have derived in the plight of a refugee torn in war? But then humans have their ways and the wars…and as the wind howls at my window I wonder if the archives would have a record that tells of animals raging a war. And I dream of Zion where a farewell to arms wouldn’t just be the title of a Hemingway work but reality. No Country for old dogs? Retirement shouldn’t mean death for the heroes – humans or hounds. For someone who has given his entire life to serving the nation- detected bombs, thwarted terror plots, won medals and more, this is as absurd and inhumane a treatment as killing a soldier once he has retired. Retirement shouldn’t mean death. 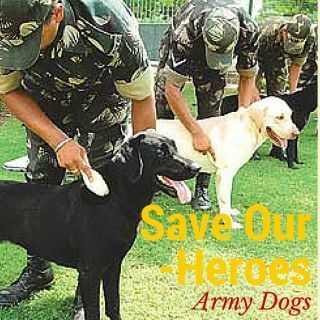 A significant quota of our financial budget goes towards the army, why not rehabilitate our animal heroes? I love the defense forces and everything they do for the nation but isn’t it time, the top brass takes the case of the hound and horses too? Or are we putting them to the same abysmal fate as the dog of Tetwal? The terrorists kill the dogs for they spell trouble for them and the army kills them because dogs are no longer of use. Give it a thought, please. Come January 26th, the 66th Republic Day of India, and the Indian Army’s canine division will march down Rajpath after a long gap of 26 years along with their handlers. They would pay homage to Mansi, a four-year-old Labrador who died during an encounter between security forces and heavily-armed infiltrators in Tangdhar District of Jammu and Kashmir last August. 26 years later, the Indian army's canine division will march down Rajpath on the occasion of 66th Republic Day of India. They'd pay homage to Mansi, a four-year-old Labrador who died during an encounter with the terrorists in Jammu & Kashmir. One of my friends who has served the army in the J&K assures me that the dog is the army’s best friend in Kashmir. Brilliant post, Abhi! It is hope that will eventually deliver us and our posterity and therefore very imperative that we cultivate a culture of positive hope…….. very well written! Quite moving indeed. The individual and society 🙂 That booked changed many. Ah there is a reason I maintain Calvin is so intelligent! Pingback: War Horse movie review ─ proudly sentimental | Dog with the blog! True. But you know most of human’s scientific-technological progress is due to R&D in military. That’s one aspect which can’t be ignored. Most wars are for false personal or nation’s pride which is sheer stupidity.And you know avg IQ of humans has started rising only in past few hundred yrs. STill a long way to go. Understand the sentiment of the post.Agree with it too. But that’s one side of story..really.